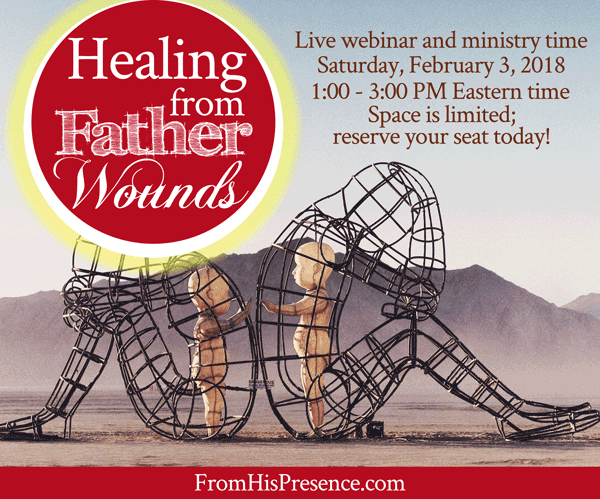 Click the image to register for the “Healing from Father Wounds” webinar and ministry time! As I was studying this morning, Holy Spirit put on my heart the deep need that so many people have to find healing from father wounds. What do I mean by “father wounds”? Not having been provided for; etc. And Holy Spirit downloaded to me a whole outline for a class and ministry time He wants me to facilitate. So, we’re going to do this thing! how to separate your relationship with God from your negative experiences with earthly father figures; and more! We’ll also be walking through inner-healing prayers and heart-healing activation exercises together on the webinar. Using very simple prayers and activation exercises, I have seen so many people healed from father wounds and set free to move forward with God as their Father. And that’s what we’ll be doing as a group on the class. This will not be one-on-one ministry time, but group ministry time … but it will be incredibly powerful. If you’ve been wounded by father figures in your life, you will NOT want to miss this. Cost: $20 per person for this advanced study webinar. Only 100 seats are available for this live webinar and ministry time. Also, please note: Watching this webinar live requires Chrome browser and a desktop or laptop computer. Mobile devices, including iPads, will NOT work. Beloved, this class and ministry time about healing from father wounds will be powerful. If you’re carrying hurts from the father figures in your life, please make sure to attend. I’m believing Holy Spirit to bless you and heal your heart during this class. I look forward to seeing you there!